It is important to have in your mind gospel verses from God's Word as you speak to the unsaved around you. God will give you opportunities if you are prepared! "Be ready always to give an answer to every man that asketh you a reason of the hope that is in you with meekness and fear" (1 Pet.3:15). This little book arranges verses from the KJV under a number of headings. These verses answer questions often asked by the unsaved. They give you easy reference, both for quick use and easy memorization. There are many verses, with some repeated as they fit more than one heading or category. 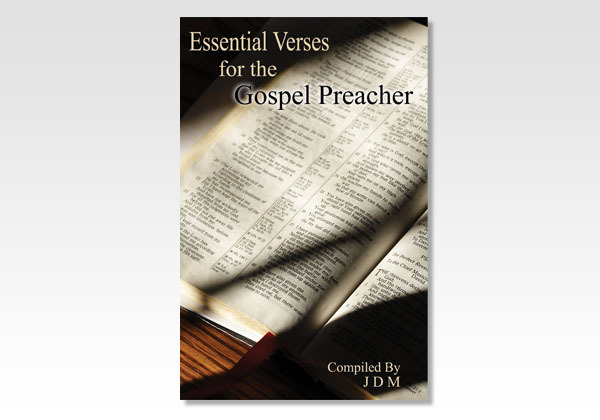 We recommend you carry this little book in your Bible case, briefcase, lunchbox, purse, or pocket so that you may be able to fill your mind with these key gospel verses and prayerfully transfer that knowledge to those around you. Most of the material in this book was first published in tract format by a brother who wishes to remain anonymous. With his permission we have expanded it and put it in this book form. We pray that the Lord will use these verses from the Word of God to save many from a terrible hell and bring our Lord much glory." 64 Pages – Softcover – Compiled by J. D. M.